Cherry Almond Granola - Bake.Eat.Repeat. Homemade cherry almond granola – this crunchy granola is healthier and tastier then the store-bought kind – and so easy to make! I haven’t posted a granola recipe here for eons. And I make it every couple weeks, so it’s a little crazy that I haven’t shared one for so long. Not that there aren’t enough granola recipes here already – there probably are. 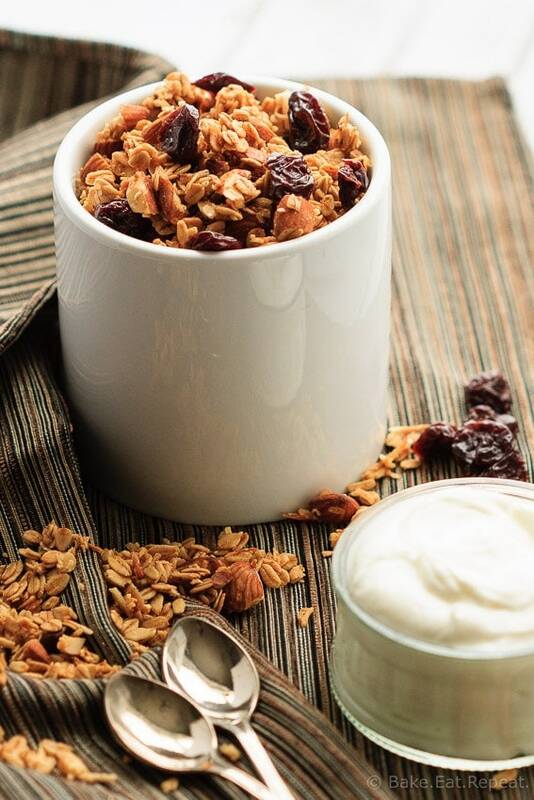 No, scratch that, there can never be too many – homemade granola is amazing. This cherry almond granola is the version I’m currently obsessed with. Almonds, coconut, rolled oats and dried cherries, sweetened with a bit of honey and brown sugar and baked until crisp and amazing. This literally takes about 10 minutes to throw together. I actually made it in the morning before the kids even headed off for school (no, our mornings are not all relaxed and organized, it’s just really easy to make). Although, that being said, I probably wouldn’t have made it before having my morning coffee if I didn’t want to attempt to take pictures before the sun set at noon (okay fine, it’s not that early, but close). That’s only because coffee always trumps breakfast though. If I have ten minutes to spare in the morning before bundling everyone up and heading out the door, you better believe I’m not trying to shovel some breakfast in (or cook for that matter) – I’m attempting to down a hot cup of coffee and wake up all the way. 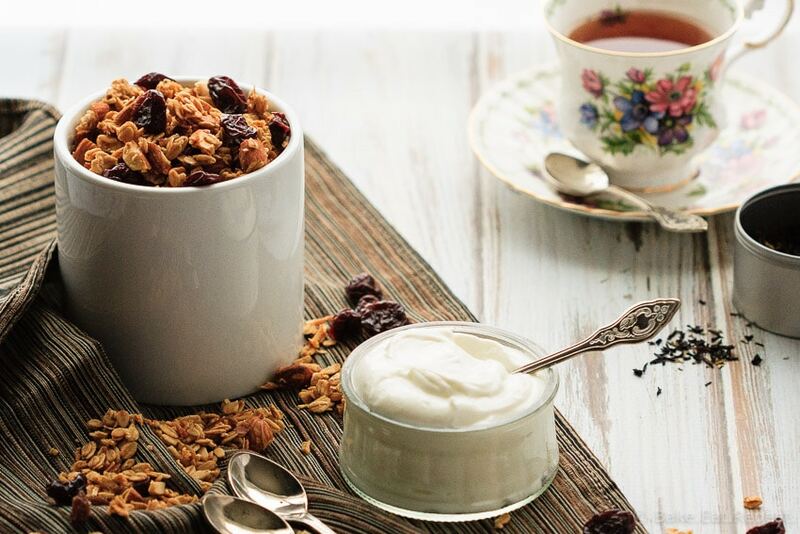 When I have homemade granola made already though, you can bet that I’m grabbing a bowl of yogurt with a generous scoop of granola on top to have with the second third cup of coffee. A healthy, filling breakfast that keeps me going all morning. Or, you know, all afternoon when coffee is all that happens before lunch-time (this may happen too often – anyone else?). Breakfast for lunch is the best. Especially when it involves homemade cherry almond granola. With more coffee of course! Homemade cherry almond granola - this crunchy granola is healthier and tastier then the store-bought kind - and so easy to make! Preheat the oven to 250 degrees F. Combine the oats, almonds, coconut, cinnamon and ginger in a large bowl. In another bowl or measuring cup, combine the brown sugar, canola oil, honey, apple juice, salt and vanilla. Pour the liquid into the oat mixture while stirring to combine. Mix until the liquid is evenly distributed. Remove from the oven and allow to cool completely. Stir in the dried cherries. Transfer to a large airtight container. It will keep well in an airtight container at room temperature for 7-10 days. homemade granola is seriously the best! this look perfect Stacey, love the almond and cherry in here! Oh my gosh, you and me BOTH! I would choose coffee over almost everything in this world ;) This granola looks SO good, I absolutely love cherries + almonds together! I could post a granola recipe pretty much every other week, haha! I'm always on the hunt for new recipes - I'll have to try this. The cherries sound amazing! Homemade granola is definitely the best! I love finding new version to try out, too. This cherry almond flavors sounds SO good, Stacey! Such a great idea to use dried cherries in here. Love it! I love homemade granola and this looks just perfect! The cherries must add so much flavor! 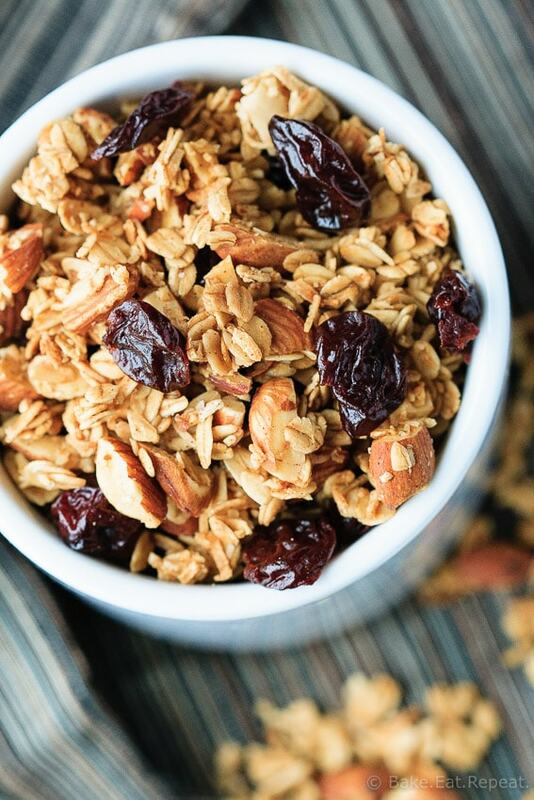 This cherry almond granola sounds fantastic, Stacey! I love those two flavors together. It works so well!